iPresas participated in the XXVI Edition of the Congress of ICOLD (International Commission on Large Dams), held in Vienna (Austria) during July 2nd – July 6th 2018. 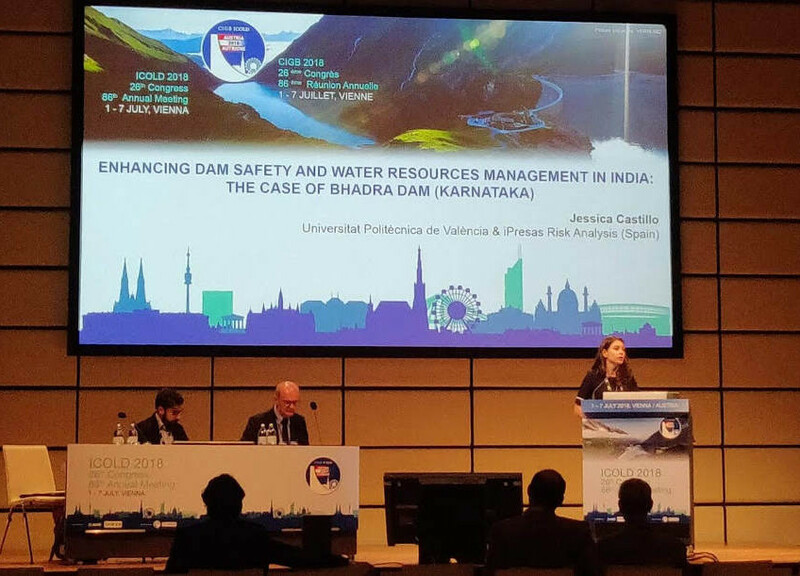 Specifically, Jessica Castillo, Head of RD Projects at iPresas, presented a contribution with the title “Enhancing dam safety and water resources management in India: the case of Bhadra dam (Karnataka, India)” for the ATCOLD Hydro Engineering Symposium celebrated during July 2nd and 3rd, prior to the Congress. In addition, Adrian Morales, iPresas CTO, presented together with Facundo Souto (ORSEP, Argentina) a contribution entitled “Implementation of risk analysis to inform dam safety from a regulatory perspective: application to Cerros Colorados system (Neuquén, Argentina)”, selected as an oral presentation during the technical session Q101: Risk analysis. The work included the results of the project performed by iPresas in collaboration with the Organismo Regulador de Seguridad de Presas (ORSEP) of Argentina in the period 2017-2018.
iPresas also collaborated with a poster format presentation of other two contributions published in the proceedings of the Congress. The first one, entitled Risk analysis in San Marcos Dam (Spain): a new step forward for risk-informed safety management of regional Government of Extremadura dams, was developed by iPresas in collaboration with the regional Government of Extremadura and PAYMACOTAS Extremadura (authors: Manuel Setrakian-Melgonian, regional Government of Extremadura, Ignacio Escuder-Bueno, Adrian Morales-Torres, Jessica Castillo-Rodriguez, and Dolores Simarro-Rey); and a second contribution, entitled Plan of strategic actions for the rehabilitation of 164 dams of Brazil based on the Brazilian risk-based methodology, presented in collaboration with Gas Natural Fenosa Engineering, within the framework of the PLANERB project (authors: José Manuel Alonso, Rafael Ribeiro, Ignacio Escuder, Ignacio Guerra, Modesto Sánchez and Adrian Morales). The event, which involved the participation of 1000 individuals, brought together worldwide professionals and multidisciplinary experts to discuss, deliberate and share knowledge on management strategies in the field of dam safety. On this occasion the event included both the Congress and the 86th Edition of the ICOLD annual summit, in which iPresas participated in different meetings held by different technical committees on Sunday July 1rst.